On Nov., 25, 2010, Thanksgiving afternoon, Sally Collins passed on at home in the arms of her husband, Dan. She was born Sept. 8, 1944, Sara Elizabeth Twining to Ruth and Wilber Twining in Oakland, Calif. In June 1964, she married Norman (Sandy) Liman in Orinda, Calif. Their only daughter, Shellie Liman Honemann, was born Aug. 8, 1972. The couple divorced five years later. On Dec. 21, 2009, at the Hemingway Memorial in Ketchum, Idaho, after a 25-year engagement, she was wed to her present husband, Daniel P. Collins. Over all these years and to all those people in her life she was "Sally." Sally was raised in the Sierra Nevada mountains in Pinecrest, Calif. There she attended a one-room schoolhouse until high school. During these years, she helped her parents in running the Pinecrest Chalet, which catered to youth groups of 50 or more, both summer and winter. In high school she was a cheerleader and member of the school band, playing the clarinet, but where she excelled was in skiing. The Pinecrest Chalet was minutes from Dodge Ridge Ski Resort and ski racing was her passion. Success followed success, from the Dodge Ridge Ski Team to the Junior National Team, to the U.S. Ski Team to dominating the Sun Valley masters competitions in the 1970s. 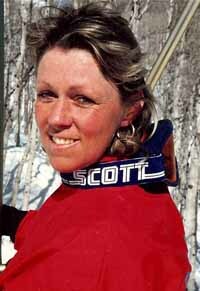 In 1969 Sally became the first member of the Bonnie Bell Ski Team, which consisted of 10 girls marketing Bonnie Bell cosmetics to the ski industry. They were always the hottest girls on the slopes! Her athletic abilities weren't limited to just the slopes. In the 1970s, the Limans built Ketchum's first fitness center and racquetball club, the Wall Bangers, housed on the present site of Perry's Restaurant. Sally was a racquetball instructor and participated in competitions, winning tournaments. Then there were the horses. From Pinecrest to Ketchum, there were always horses in Sally's life. She became active in the team roping competitions in Bellevue, Idaho. With the help of the Schernthanner family and lack of zoning laws, she had a corral next to her house, enticing the elk to feed on leftover hay during the winter. Smaller animals were also a very large part of Sally's life. Dogs and cats were a large part of her life, from her parents raising great Pyrenees to her border collie, "Patches," who now also mourns her loss. To support her life she had many occupations. As a single mom for many years, she waited on tables, opening the Colonel's Pancake House at 6 a.m. for the early risers of Ketchum. She also worked at Peter's and the Ore House. For several years she worked for Dr. McElmurry in Bellevue as his dental assistant. Sally had a spirit that would always light up those around her. She is greatly missed by her family. Sally was preceded in death by her mother, Ruth Twining, and her brother, Richard Twining. In July of this year, she and her family helped celebrate the 90th birthday her dad, Wil Twining. He and his wife, Rosemarie, are now mourning the loss of their daughter. Also in mourning are Sally's brother, Chucker Twining, his wife, Debi, and their two children, Carin and David; Sally's sister, Mischel, and her husband, Art Sabel and sister, Robin Twining. Sally's only child, Shellie, and her husband, John, and their two children, Hunter and Hana, are greatly missing her. In Ketchum, she is mourned by her husband, Dan, who was deeply devoted to her, and her border collie and companion, Patches, grieves her absence. Sally made friends wherever life took her and she is mourned by them all. Sally was not without her demons. Her later years were menaced by a constant battle with alcoholism. She was able to survive those crises with the aid and support of the Wood River medical community. The frequent visits of the Ketchum EMTs and the Wood River Hospice helped to soften the hard edges of Sally's final years (not as much as See's Candies, though). Please join us in a celebration of Sally's life at Whiskey Jacques' (upstairs) in Ketchum, Idaho, on Monday, Dec. 13, at 5 p.m.
A contribution in Sally's memory to the Blaine County Ambulance District in care of Ketchum Fire & Rescue, Box 966, Ketchum, ID 83340 or the Hospice of the Wood River Valley, Box 4320, Ketchum, ID 83340 would be appreciated by her family.